In 1989, Mitchum, Inc. was purchased by John Wilson, who maintains the facility and the philosophy of Mitchum’s original slogan. Mitchum operates out of a 80,000 square foot facility in Charlotte, North Carolina, which produces around 2,000 pounds of Potato Chips every hour. Mitchum Quality Snacks has many long standing relationships with major supermarkets and independents throughout the Southeastern United States, the Caribbean and Mexico, who use the Mitchum Private Label service. Below are some of the companies Mitchum works with. 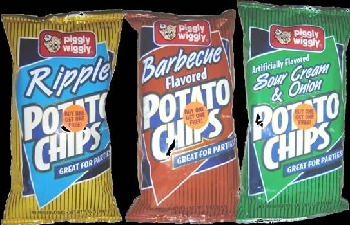 Mitchum's private label Chips are distributed to over 300 Piggly Wiggly stores in the Southeast, including North Carolina, Georgia, Alabama and Mississippi. Mitchum produces IGA Potato Chips for distribution through IGA warehouses located throughout the Eastern United States, including: Connecticut, Georgia, Maine, Maryland, Massachusetts, New Hampshire, New Jersey, New York, North Carolina, Rhode Island, South Carolina, Tennessee, Vermont, and Virginia. Under the Hy-Top branding, Mitchum Potato Chips are sold in independent supermarkets from Maryland and Virginia to North Carolina, South Carolina, Georgia and Tennessee. Save-A-Lot centers located in the Eastern United States chose Mitchum Potato Chips for their taste, flavor and freshness. They market the Chips under the J Higgs branding.